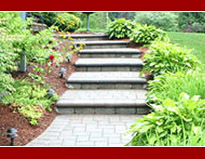 Landi supplies landscape professionals and homeowners with the appropriate landscape tools to assist in a variety of outdoor maintenance projects. Our qualified staff will assist you in making the most accurate decision in selecting the right tool for the job. Each of our products are of the finest grade. Currently, our popular product for landscaping is enhancement outdoor lighting. These easy to install lighting fixtures can be used in paver lighting, deck lighting and garden wall lighting. All of our lighting products are safe and durable. For more information you can visit www.kerrlighting.com or contact our office for assistance.